The Ozone Alliance keyboard is the outcome of the evolution of membrane keyboards. Organically integrating the best of both mechanical and membrane keyboards, Ozone Alliance is born. Multicolor Backlighting, CrossTech Semi-mechanical switches, 9 lighting effects and sound reactive technology. 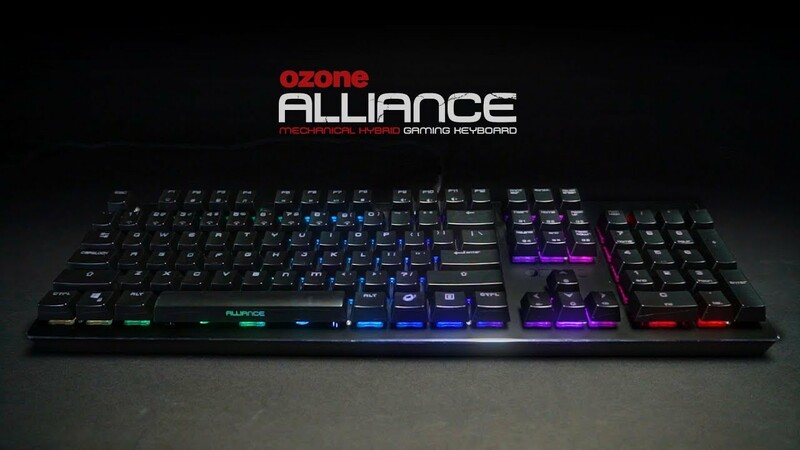 Ozone Alliance is a keyboard that adapts itself perfectly to any environment, from the tranquility of your home to the frenzy of events and other competitive environments. With its sound reactive technology it will transmit the intensity of ambiental sound in the form of light beams, accompanying you in the most frenzied battles as well as in quieter surroundings too. One of the key features in this keyboard is the new lighting system with 9 RGB color and sound reactive technology. 25 anti-ghosting keys allow you to keep flawless control when you´re pressing multiple keys at the same time. Alliance is much more than a fusion of technologies, it is the technology of the future. The feel of this keyboard gives you the sensation of using a mechanical keyboard. It's equipped with CrossTech semi-mechanical switches, designed to ensure optimal speed of response and accuracy, as well as a touch and durability very similar to mechanical keyboards. Enjoy multicolored lighting with 9 effects that adapt to the ambient sound. This keyboard also benefits from state-of-the-art features: 25 Anti-ghosting keys, Macro and Multimedia Control within an antisplash design and with a very intuitive analogue configuration.